When Vermont Yankee was set to close, activists such as Bill McKibben claimed that Vermont “is completely capable of replacing (and far more) its power output with renewables, which is why my roof is covered with solar panels.”[i] This isn’t what happened. Instead, natural gas generation expanded in New England. As a result, carbon dioxide emissions increased 7 percent in 2015. This increase is despite the Regional Greenhouse Gas Initiative (RGGI)—an agreement among nine states (Connecticut, Delaware, Maine, Maryland, Massachusetts, New Hampshire, New York, Rhode Island and Vermont) to reduce greenhouse gas emissions. RGGI is a cap and trade system where the greenhouse gas emissions from these states are capped and emission allowances can be purchased if an entity has problems meeting its cap. Entergy is decommissioning the plant because it expects Pilgrim to lose $10 million to $30 million-a-year through 2017 because of low-cost, gas-fired electric power that is depressing wholesale market prices and because of regulatory expenses. The NRC is forcing Entergy to invest at least $45 million to $60 million to upgrade Pilgrim to respond to a recent NRC safety downgrade of the plant–an expense that could make Pilgrim “not economically viable.” So, Entergy decided to close it. According to the ISO-New England, New England is expected to retire about 4,200 megawatts of oil, coal, and nuclear plants by June 2019, replacing them with 11,000 megawatts of proposed new power sources–two-thirds using natural gas and the rest mainly using wind to generate electricity. New England also expects to import more hydroelectric capacity from Quebec and expand the capacity of pipelines to bring more natural gas to the state. 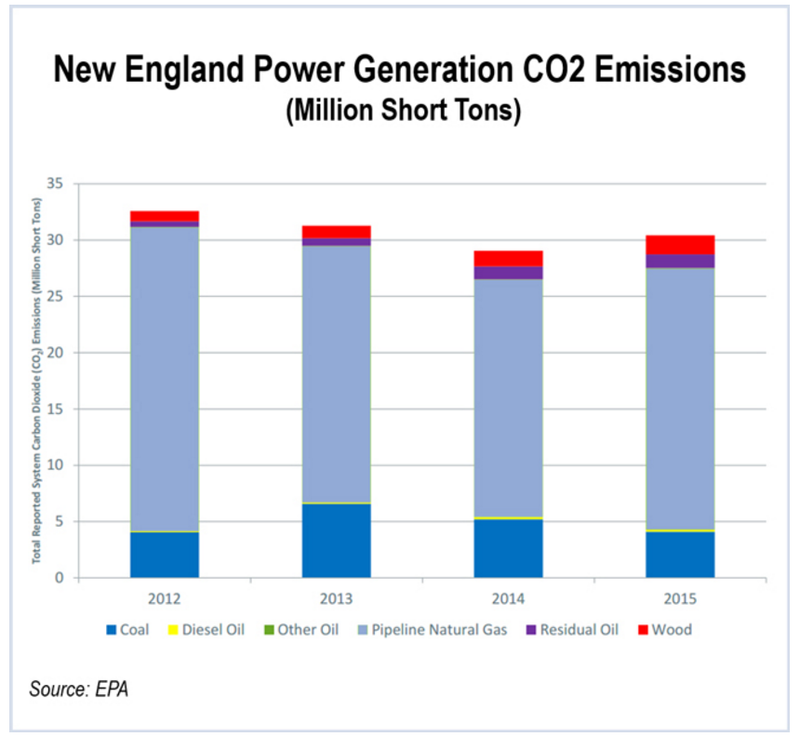 Carbon dioxide emissions are increasing as New England is shuttering its non-carbon dioxide-emitting nuclear plants due to competition from natural gas generation and regulation by the NRC. Despite environmentalists wanting wind and solar power to replace the shuttered nuclear power plants, the reality is that intermittent technologies (wind and solar) cannot replace plants that can operate 24/7. Natural gas will provide most of the replacement power, increasing carbon dioxide emissions. If the state intends to meet its greenhouse gas reduction goals, it will most likely have to rely on RGGI, which did not seem to provide the necessary reductions when Vermont Yankee was shuttered.